TCRN is a one of a kind business networking and marketing company with a strong emphasis on networking and referral generation. Learn more about how to be a member in Texas’ most exclusive professional community business network! Strong relationships with other businesses are essential in today’s professional landscape. TCRN is an expert in educating business owners and operators how to network correctly and effectively. TCRN organizes monthly networking events for its members because regular business networking is a key ingredient for a company to maximize their success. TCRN utilizes different methods of leverage to allow local businesses to spend less on their marketing and advertising while increasing revenues, providing a superior Return on Investment. Business growth is stimulated by synergy from TCRN’s unique business model making it easier for businesses to accomplish more. Do you think your business would be a good fit for Texas Community Referral Network or want to know more about how TCRN can help market your business in Houston? Contact us today for more information about how to become a TCRN member! 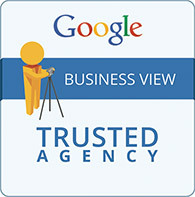 A premium quality 360 virtual tour of your business powered by Street View technology. It’s simple, fast and affordable.